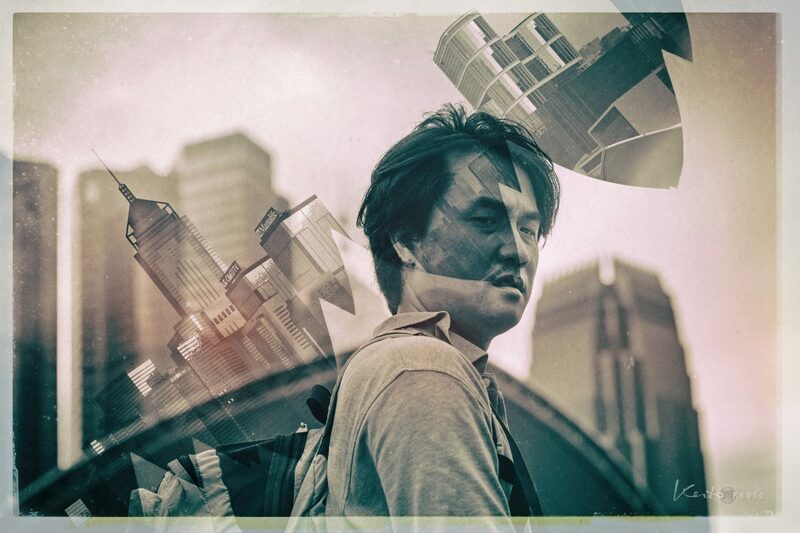 The double exposure idea has been around for a long time, I remember doing it accidentally with film cameras when I forgot to wind it forward…the outcome could be great or disastrous! These days, with digital its much easier to judge the outcome as I can look at the results instantly and decide whether to take another one or not. 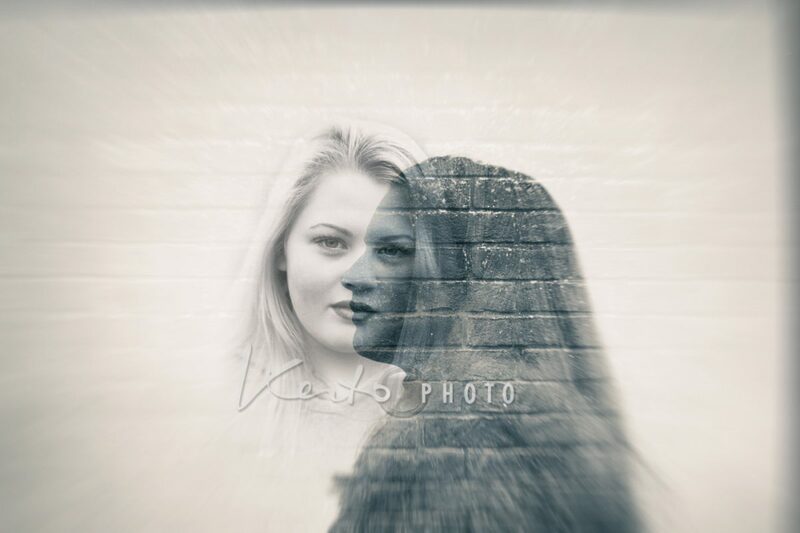 What I love about double exposure is creating that magic which always has that element of surprise to it. You can never quite predict the outcome. And whilst it is magical and much more creative way for me as a photographer to create something unique, it’s also much more fun for the client! 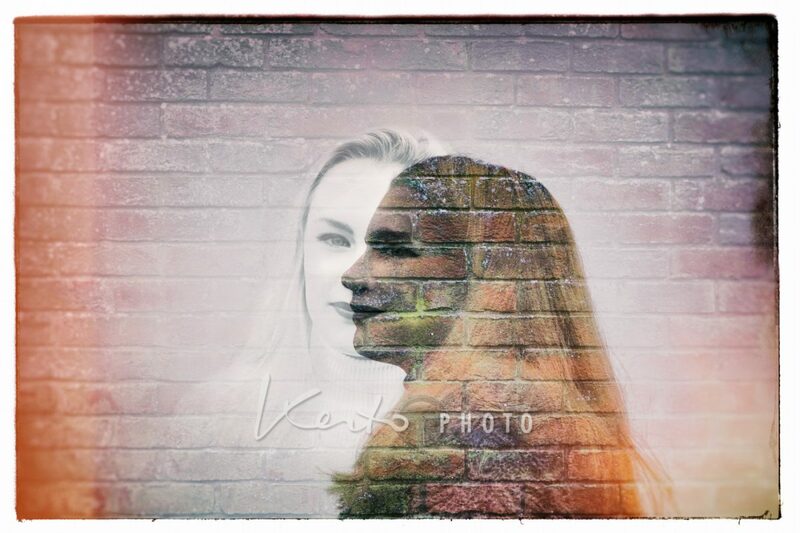 With multiple exposure photography you can choose your favourite subjects and items, people, family, pets, friends etc etc etc. to overlay people’s portraits or to include those into the final collage. You may want to include your lost family member or a pet or someone who lives abroad and cannot attend an event. You can now add them seamlessly as though they were there in the first place! Sounds good? If so, maybe you have a bunch of photos in your draw somewhere waiting to be turned into something like this? Why not let me have a look and suggest some options for you? Annual foodie get-together organised by Del. 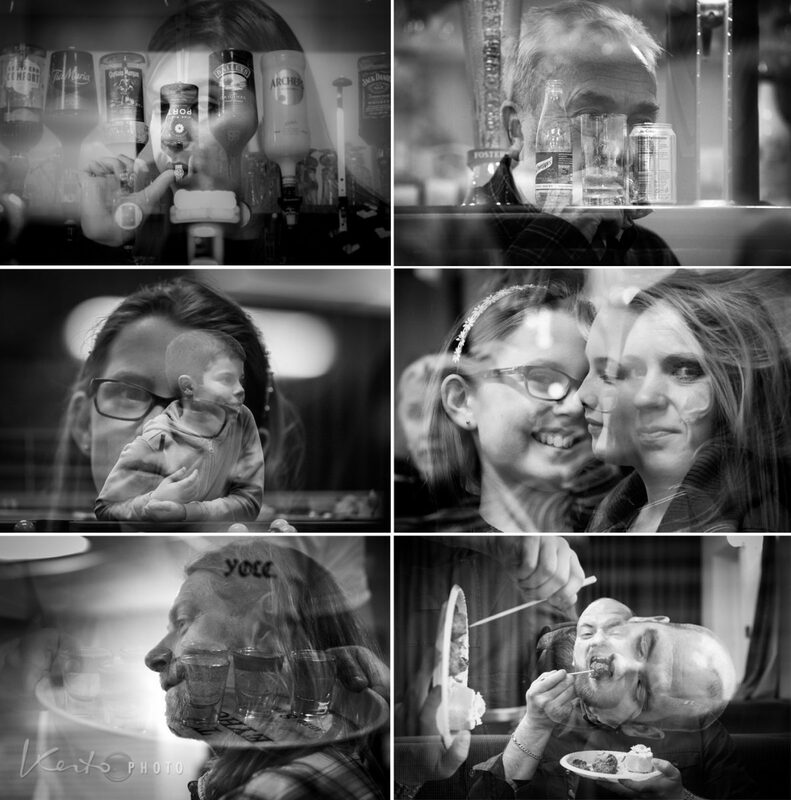 Below is a collage from a number of images I took at the event. 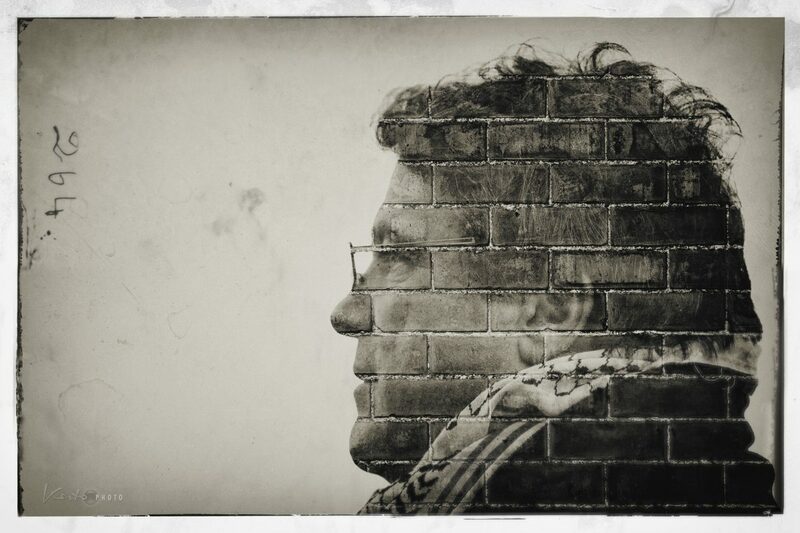 Interestingly I had this final result already in my head before I made a start in Photoshop. The light can often let you down at the events, hence I decided to turn all the images into B&W. Most of them were taken at ISO 10000 (to those of you who don’t understand what this means, it’s very high and wouldn’t be recommended anywhere)…nevertheless, you need to get the best out of every situation, right? 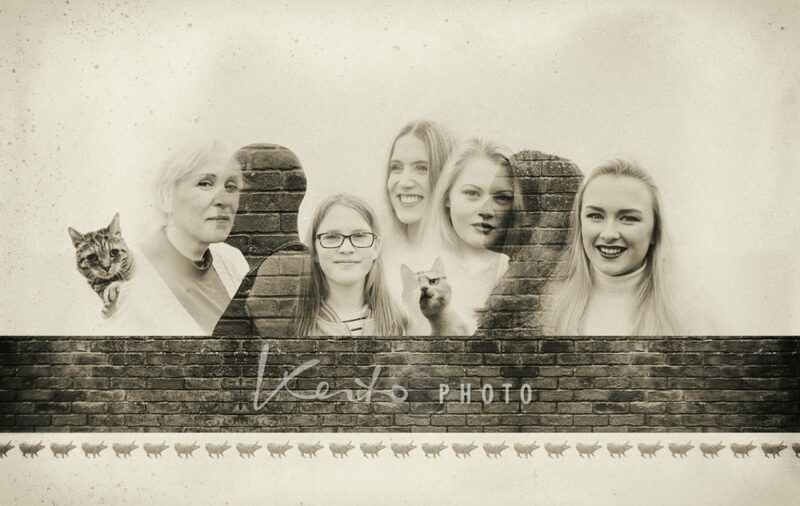 So I decided to go for the more unconventional images, using the elements from the venue to overlay the people’s portraits. The wine glassed, shot glasses, brick from the bar wall, texture of the light in the ceiling, spirits bottles and other people, all were used to create something a bit different with the double-exposure technique. 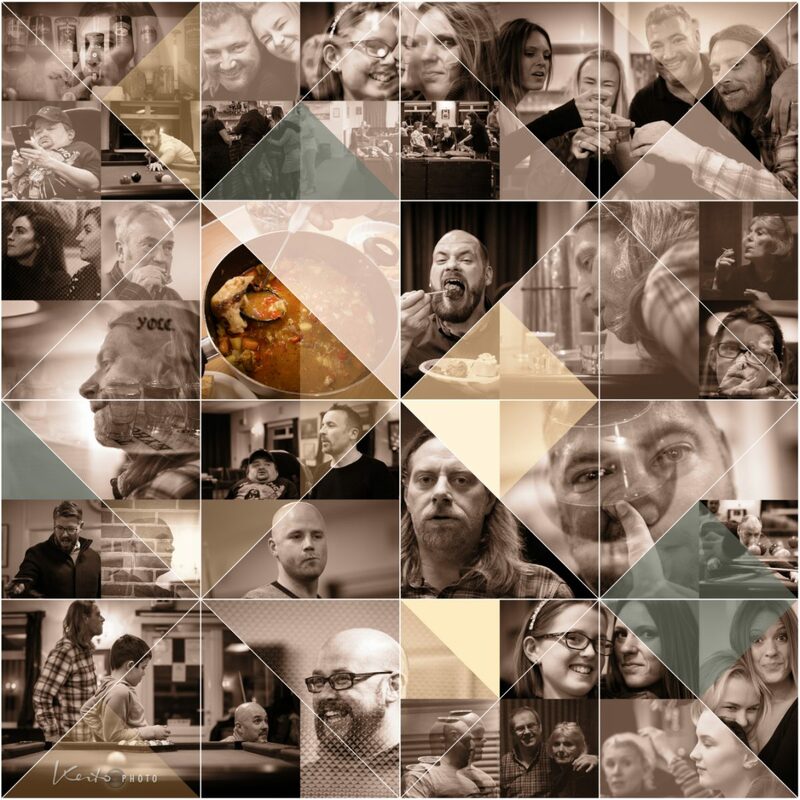 In the final version I chose images to best describe the evening – food, being what brought people together that night, has the center stage being the only image in colour in this collage. The following images of each person were taken separately and then combined into one image once I got home. 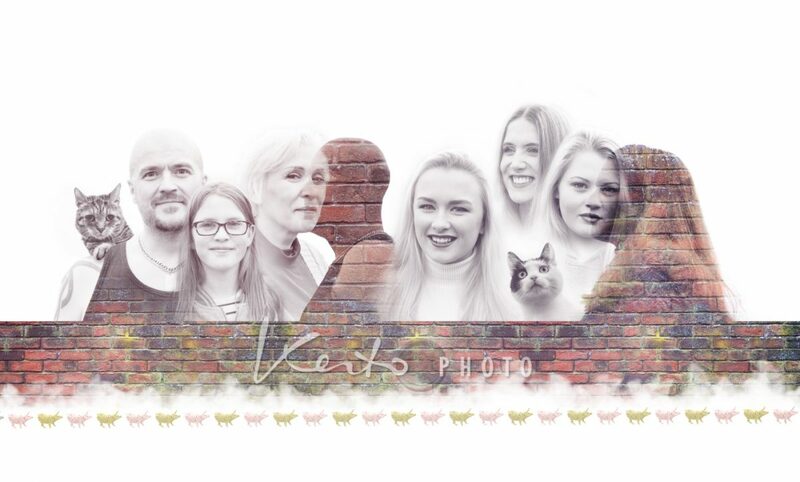 I used the brick background image to overlay the portraits, as that’s what the client asked for. I would also like to mention that this shoot took place outside at client’s location in January, hence we were very dependent on the weather…which being winter in the UK, of course meant it wasn’t great! But hey, I love a challenge so that’s not a problem! 🙂 At least it wasn’t raining and too cold, so the participants weren’t frozen to the bone! Here’s something I did a few years ago for my mother as a Birthday present. 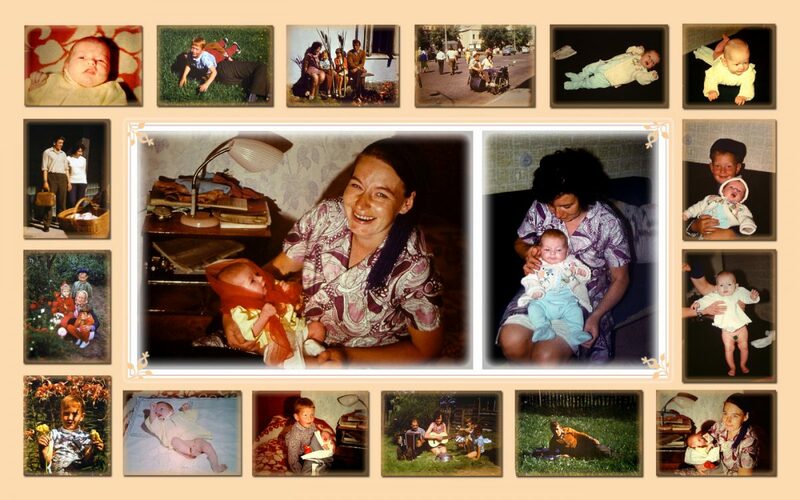 All the photos here are of my family: mother, father, brother, grandparents and a couple of close relatives we used to play with as kids…so all very fond memories and people…well, I can’t really remember any of it, as I was far too young being a mere new born in the images! 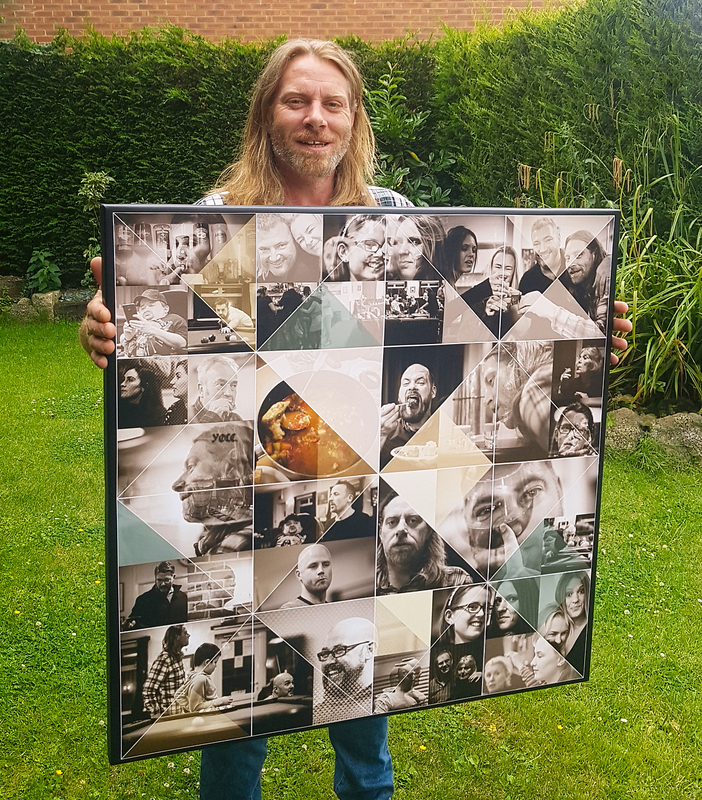 All the images came as film slides/transparencies, so those were all scanned in and then turned into digital files, retouched and made into a collage in Photoshop, then printed onto 24″x32″ canvas. I will update you with the price list and more details very soon… but I can tell you I won’t be charging for the shoot, just the image files and prints you order afterwards…so do get in touch, lets have fun! I’d love to hear from you!